You can set up recurring payments – aka preauthorized payments or subscriptions – so that membership dues can be automatically charged on a regular schedule. This saves your members the trouble of having to manually renew their membership. Recurring payments are available only for membership fees (not for events or donations), and only for paid plans (see Functionality by billing plan). 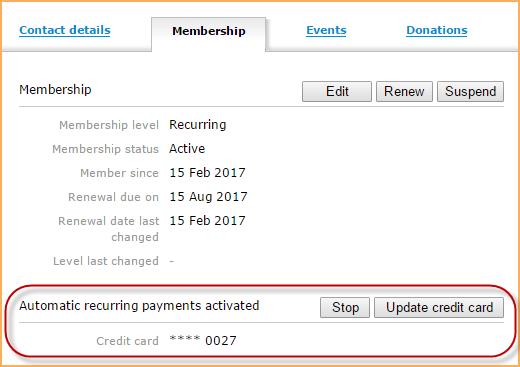 After you've configured your payment settings, you can enable recurring payments for individual membership levels. If recurring payments are enabled for a particular membership level, then members paying online for that membership level will not have any option other than agreeing to recurring payments. You can, however, set up another similar membership level without recurring payments enabled to accommodate members who do not want to consent to recurring payments. Set up an account with one of the supported payment systems and make sure you do the following. No special setup is required. Subscribe to their Customer Information Manager (CIM) service. Subscribe to the Recurring Billing service. Subscribe to the Recurring Payments service. If you do not subscribe to this service, members can only pay for recurring memberships using the PayPal Express Checkout button. Any attempts to pay using the Pay with credit card option will fail. Membership applicants for levels with recurring payments must have a PayPal account – they can't pay with a credit card without creating a PayPal account first (a limitation of the PayPal Payments Standard system). Click the Profile tab under My Account. Once you have an account set up, follow the appropriate set of instructions below to configure your payment settings for your payment system. After you have configured your payment settings, go to the Renewal policy page for the appropriate membership level (by clicking Levels under the Members menu) and select a Renewal period (if one is not already selected), then enable the Automatic recurring payments option. Repeat for each appropriate membership level then Click Save. If you choose a specific date rather than the join date for a renewal period, new members will be billed the full membership fee for the period between the join date and the first renewal date. You can enable prorating of membership fees for levels with automatic recurring payments only if you are using Authorize.Net, or Stripe as your payment system. Recurring payments are not supported for renewal periods greater than 1 year. If your site is using PayPal Payments Standard, the membership fee for the period between the join date and the first renewal date may be split into multiple charges billed as trial periods by PayPal. if you are using days as the basis for your trial period, they cannot exceed 90. After that, you will have to use months. if there are two trial periods where the first period is not free, then the second trial period must also not be free. You might consider switching to Wild Apricot Payments to avoid these issues. Depending on how the member pays for their membership, the member can cancel recurring payments either from their member profile or from their PayPal profile. A Wild Apricot site administrator can also cancel a recurring payment, either from Wild Apricot or from their payment system account. Members who pay for their membership by credit card can stop recurring payments from their Wild Apricot member profile page. To do so, they would click the Invoices and payments tab in their profile then click Stop recurring payments button beside the membership renewal transaction. The member will be asked to confirm their request. Log in to their PayPal account. If the member paid using their PayPal account via PayPal Express Checkout, they can also cancel the recurring payment from their Wild Apricot member profile. If your site uses Wild Apricot Payments, PayPal Express Checkout, Authorize.Net, or Stripe, you can stop recurring payments from the member's membership details. On the Membership tab, click the Stop button. You will be asked to confirm your request. 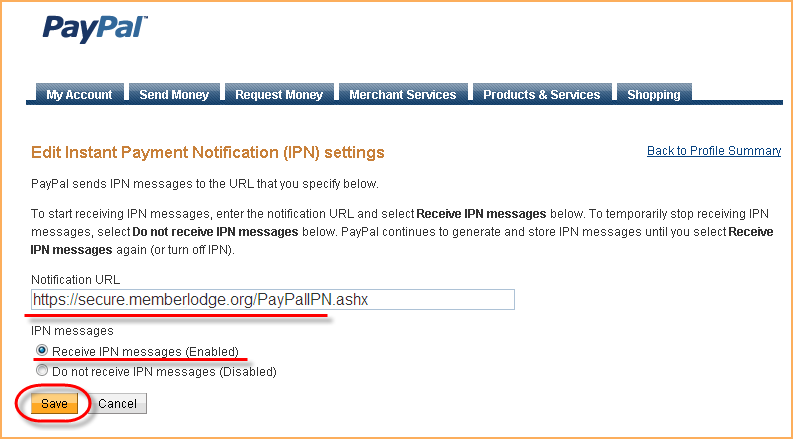 You can also stop the recurring payment from your organization's AffiniPay, PayPal, Authorize.Net, or Stripe account. If your site uses PayPal Standard, you can only stop the recurring payment from your organization's PayPal account. Cancelling a recurring payment does not affect the member's membership status. Members paying via Wild Apricot Payments, PayPal Payflow Pro, Authorize.Net, or Stripe for their recurring membership fees can change their credit card information from their member profile. Members paying via PayPal Express Checkout, PayPal Payments Standard, or PayPal Payments Pro need to update the credit card information on their PayPal profile. Administrators can update the credit card details from the Membership tab of the member's contact record. For members paying via Wild Apricot Payments, PayPal Payflow Pro, Authorize.Net, or Stripe for recurring payments, an Update credit card link will appear on their member profile under the Membership details heading. If their existing credit card is within 2 weeks of expiry, an Update credit card button will appear within a yellow warning box at the top of the Membership details section. If their credit card has already expired, the button will appear within a red warning box. Clicking the Update credit card link will allow members to update their credit card details. To verify the new credit card, a temporary charge of $1.00 USD will be applied to the card then automatically voided once the card is verified. Emails will be automatically sent to members when their credit card is 2 weeks from expiry, and when the card actually expires. You can control the delivery of these emails from the Renewal notifications section on the Renewal policy tab for each membership level. Administrators can update credit card information for members paying via Wild Apricot Payments, PayPal Payflow Pro, Authorize.Net, or Stripe by clicking the Update credit card button on the Membership tab of the member's contact record. You could also update their credit card information from their recurring profile on your payment system account. If a member upgrades to a membership level with recurring payments enabled, they will follow the recurring payment process as a new member would. If a member who is currently set up to make recurring payments changes membership levels, the effect of the change depends on which payment system your site is using. Any changes to membership level will be automatically reflected in the membership fee charged to the member. A change to membership level will not have any effect on the member's recurring subscription. 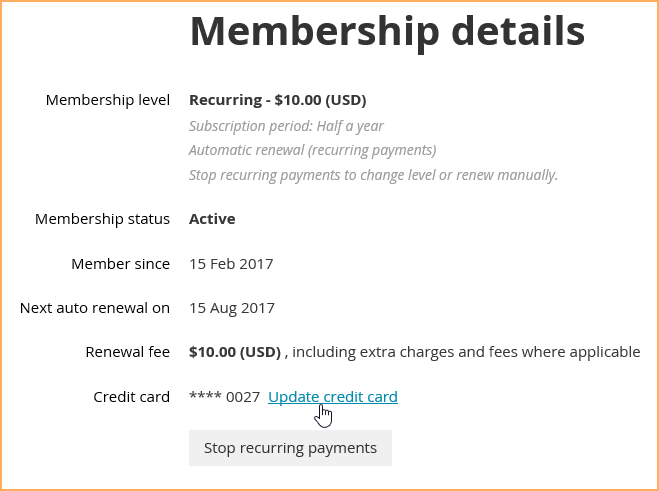 To change the level, you must first cancel the member's recurring subscription on PayPal then change the membership level as required. The effect of changing the membership fees for a level with recurring payments depends on which payment system you are using. If you change the membership fee for a level with recurring payments enabled, the change will affect existing members who will be charged the new fee on their next scheduled payment date. 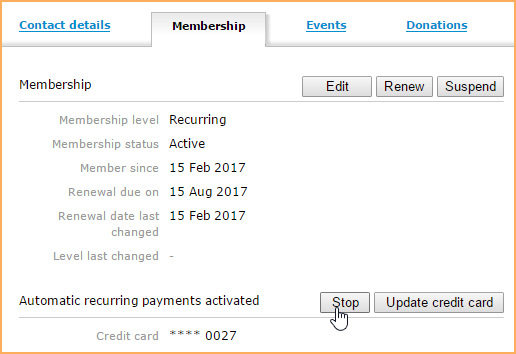 If you change the membership fee for a level with recurring payments enabled, members will continue to be charged the old rates according to the existing PayPal payment profile but will be invoiced the new amount within Wild Apricot, leading to future renewal invoices being under or overpaid. You'll have to manually update each member's recurring payments profile through your organization's PayPal account. A message will be displayed when a change like this takes place. The effect of changing the renewal period for a level with recurring payments also depends on which payment system you are using. If you change the renewal period for a level with recurring payments enabled, the change will be applied to existing members. The renewal date will be shifted according to the current renewal settings. When you change the renewal period for a level with recurring payments enabled, the change will not affect existing members. If you want to change the renewal period for existing members, you have to make the change manually to each member record in Wild Apricot, and separately update each recurring payment profile in PayPal. Otherwise, the recurring payments will continue to take place as originally scheduled. Any existing membership level can be changed to enable recurring payments. The next time a member renews their membership, they will follow the recurring payment process as a new member would. If you change a membership level to disable recurring payments, the effect will depend on the payment system your site uses. If you are using Wild Apricot Payments, Authorize.Net, PayPal Payflow Pro, PayPal Payments Pro, PayPal Express Checkout, or Stripe, the payments will be automatically canceled for existing members. If you are using PayPal Payments Standard, you must cancel the recurring subscription for each member on PayPal. If a recurring payment is not successfully processed, it will be retried, up to a specific number of attempts. The number of attempts depends on the payment system your site uses. The profile deletion will be recorded in the audit log. A Recurring renewal failed email will be automatically sent to the member and the organization contact, unless you have disabled these emails from the Renewal policy tab. When a membership applicant selects a membership level with recurring payments enabled then clicks Confirm, a Pay recurring invoice button will appear instead of a Pay online button. Recurring invoices have to be paid separately from other invoices. When the applicant clicks the Pay recurring invoice button, a detailed invoice appears. Discount coupons cannot be used with recurring payments. To complete the payment, the applicant now clicks Pay online. If you're using PayPal Payments Pro, the applicant will have the choice of clicking the Pay with credit card button or the PayPal Express Checkout button. After completing the payment, the applicant will see a confirmation message. When subsequent payments are processed, the member will be emailed a payment receipt. For instructions on customizing payment receipts, see Customizing receipts. Recurring payments can also be set up by an administrator. Doing so will update the member's payment system profile, and generate an entry in Wild Apricot's audit log. For example, setting up a recurring Authorize.Net payment would be recorded in the log as Authorize.net customer profile for recurring payment created. Profile ID= ******. 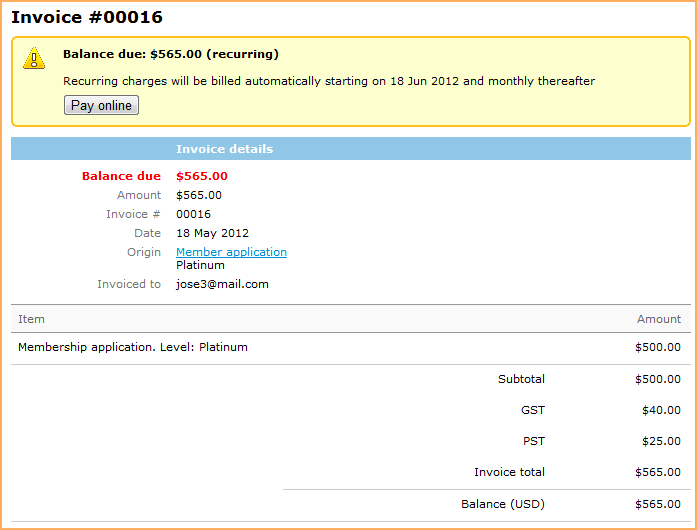 For more information, see Processing credit card payments in admin view. If you're using Wild Apricot Payments, Authorize.Net, or Stripe to process payments, any extra charges will be included in subsequent payments only if you enabled the Include in renewals option for the extra charge field in your membership fields. If you're using PayPal, extra charges applied during the initial transaction will also be included in each subsequent payment even if you disable the Include in renewals option. If you do disable this option, the invoice amount for the recurring membership renewal will be different from the payment amount, resulting in an overpaid balance that will increase with each additional payment.